I think this is my favorite DIY project yet. It’s up there with the diy tufted headboard & antique buffet transformation . Amazing right? 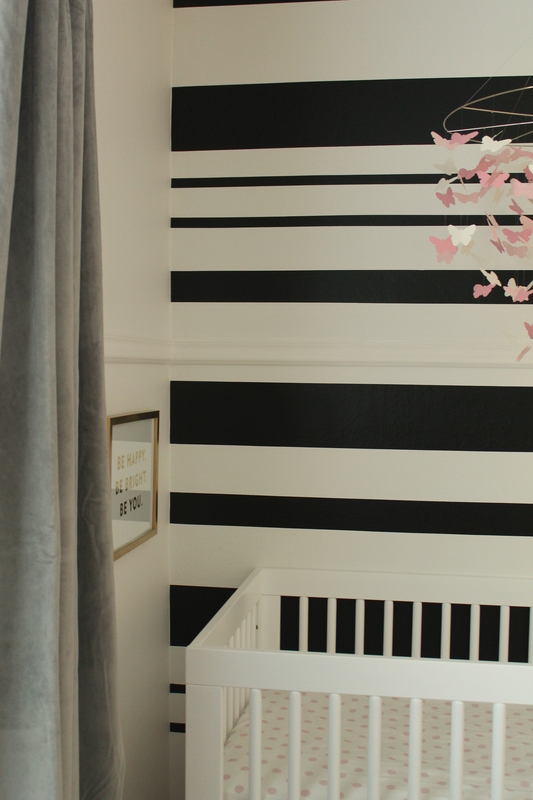 Once again, Clayton thought I was absolutely out of my mind & could not wrap his head around why I would want a black and white room with no pink on the walls! Even though I profusely explained to him that there would be pink accents everywhere, he just wasn’t understanding my whole concept. Typical. So now for the DIY portion of this post..
First you need to paint the wall white. 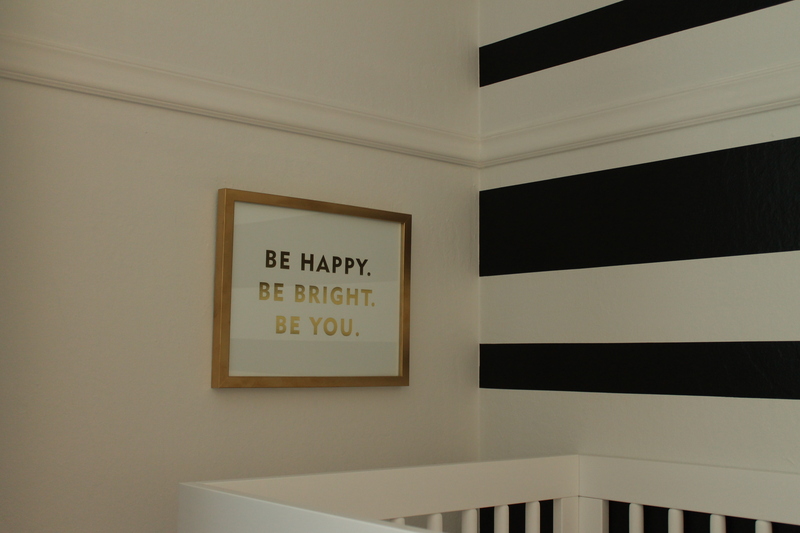 Decide how many stripes you want on your wall. Also how many inches each stripe will be. (I drew out a little diagram of this part, so I could conceptually understand how it would look on the wall) Measure them out with your ruler and make a few marks with your pencil. 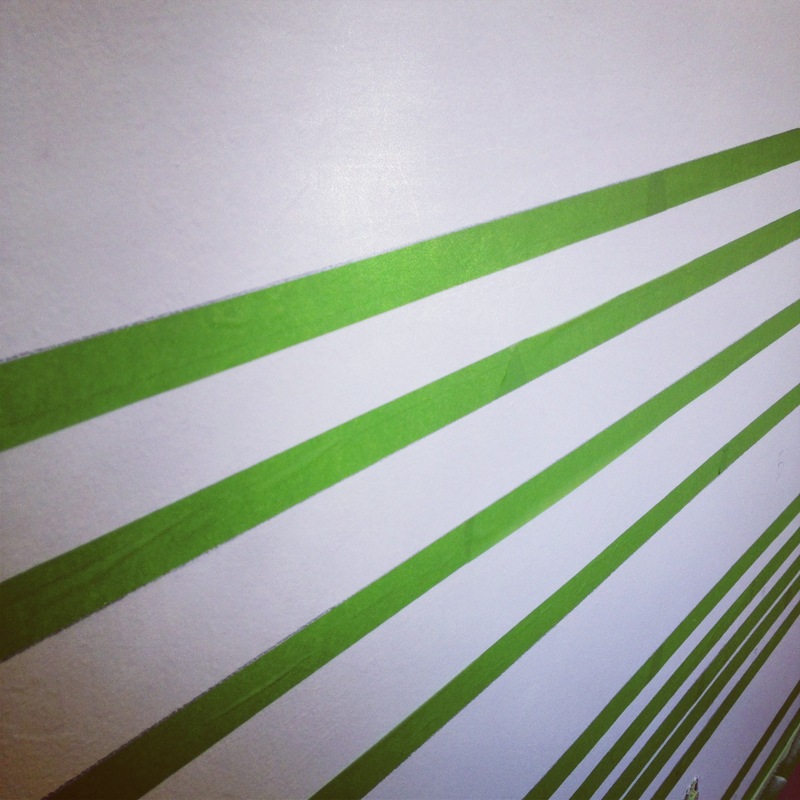 Draw a straight line across the wall, connecting the pencil marks. 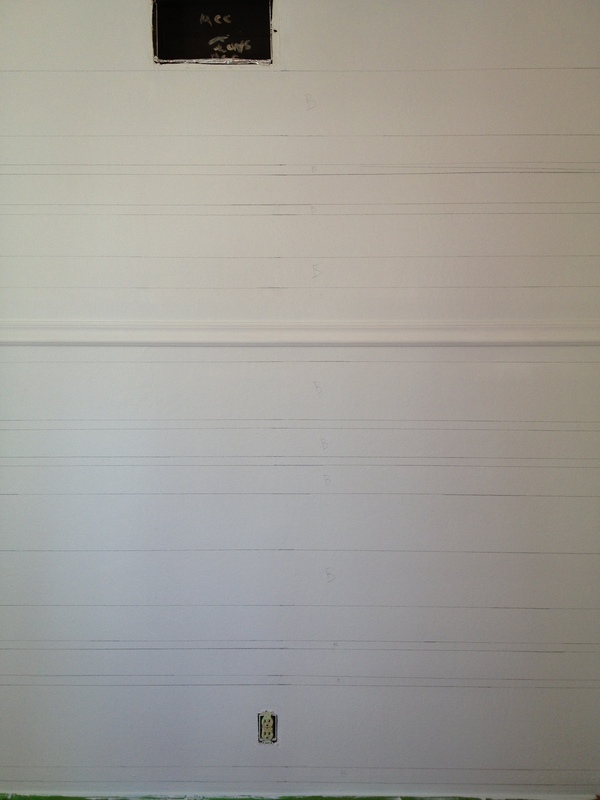 In order to keep the pencil line straight, we used the top cover piece of the window blinds. Very resourceful! Should look like this when you’re done. 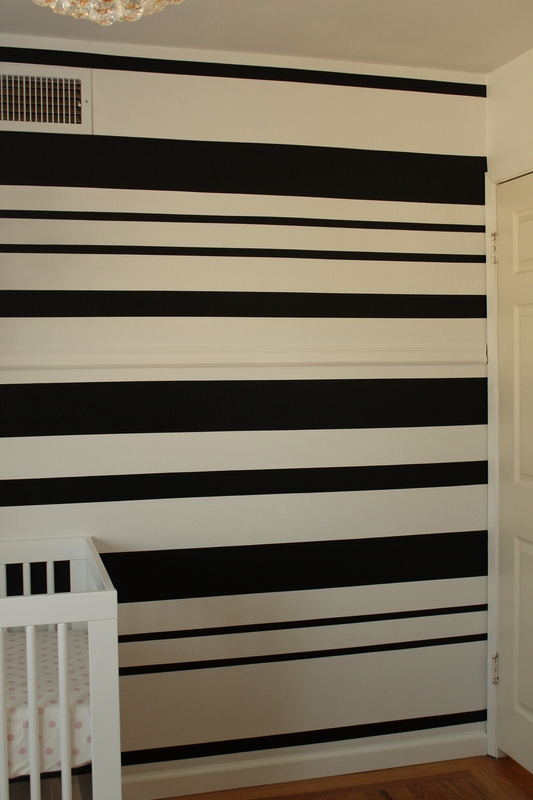 I put a “B” on each stripe we were planning to paint black, so we wouldn’t get confused. I highly recommend doing this, otherwise you could accidentally paint black where it’s supposed to be white. **Side note** You are probably thinking.. why didn’t they just use a level? Well yes, you would think that would be the easiest option. However, most older houses are built where the walls are not level. So that’s why using the measuring method is best, unless you want your stripes to be slanted. For newly constructed houses, you could get away with using the level. Now for the most tedious part of the process – tapping. I really took my time on this, making sure the tape was straight with the pencil lines. I also made sure to tape outside of the pencil lines, so that the black paint would completely conceal and pencil. Don’t worry if it’s not perfect, you can always go back after it’s dry with white paint to cover any pencil marks. Once all the tapping is done, take your plastic spackle spatula & run it across the frog tape edges, ensuring no paint seepage. Then take your white paint and do a coat inside the “B” marked stripes. This will guarantee that no black will seep through & ruin your stripes. After about 2 hours, paint on your black stripes. I took me about 3-4 coats. 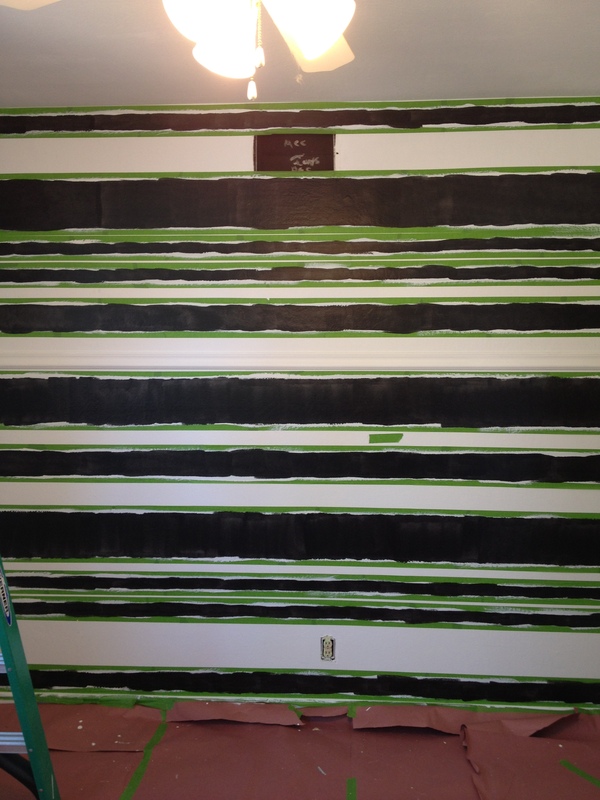 After an hour & 1/2 we pealed off the frog tape, to reveal perfect stripes. I was amazed. I couldn’t believe how good it looked. You don’t want to wait more than two hours to remove the tape. 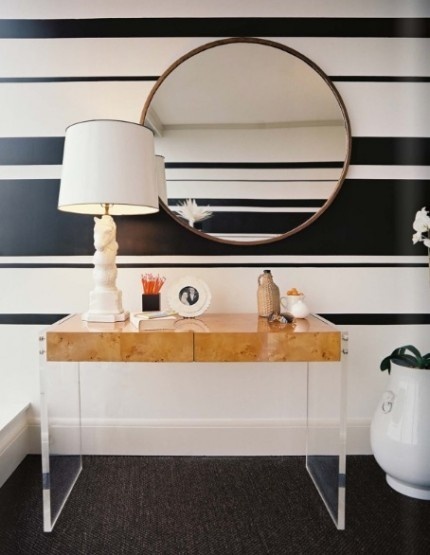 I especially love the skinny stripes on the wall. Honestly, I’m no professional painter or DIYer by any means.. so if we can do it, you can too. I’m so happy with how it turned out. For the next few days after it was complete, we both couldn’t stop going in the room just to stare at the wall! lol. Makes me happy! Can’t wait for our girl to arrive, so I can spend more time in here. Maybe the husband will start having more faith in my crazy unique ideas now. 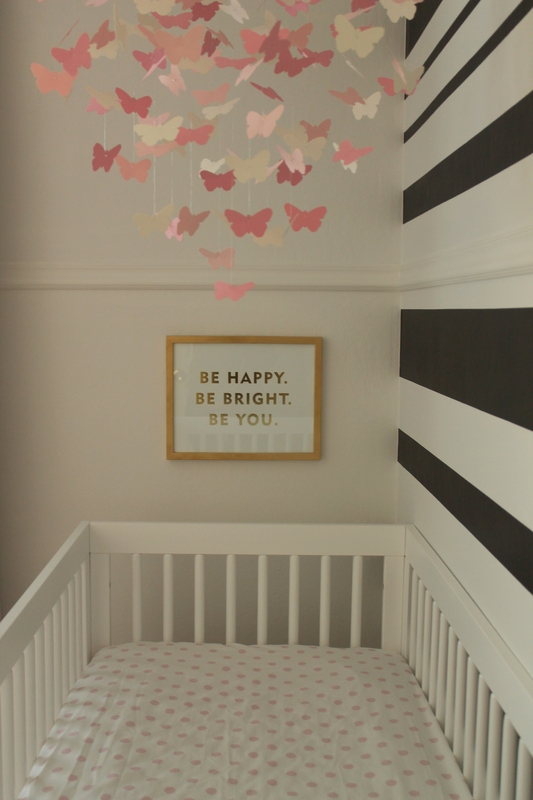 He loves the room & so do I.
I’ll share more nursery photos once it’s complete! 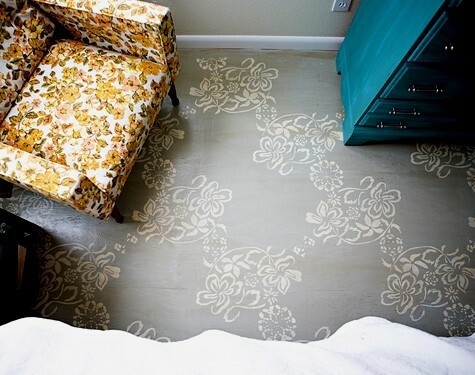 I have been really into lace stencils lately.. They look incredible on furniture & walls too. 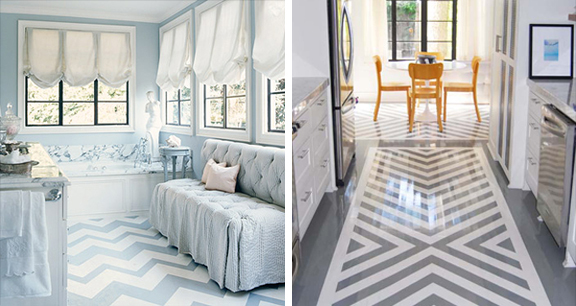 Chevron striped floors are a huge trend right now. 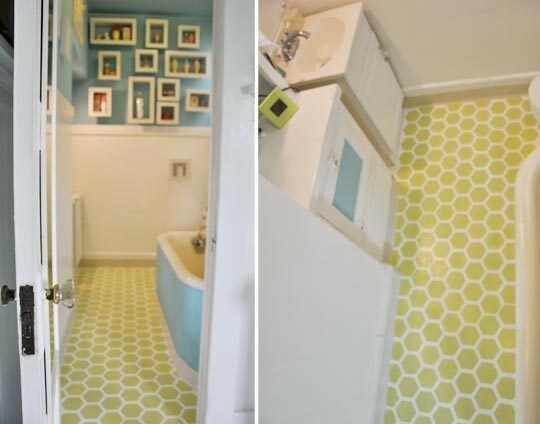 Pale grey or blue would be so cute in a nursery. 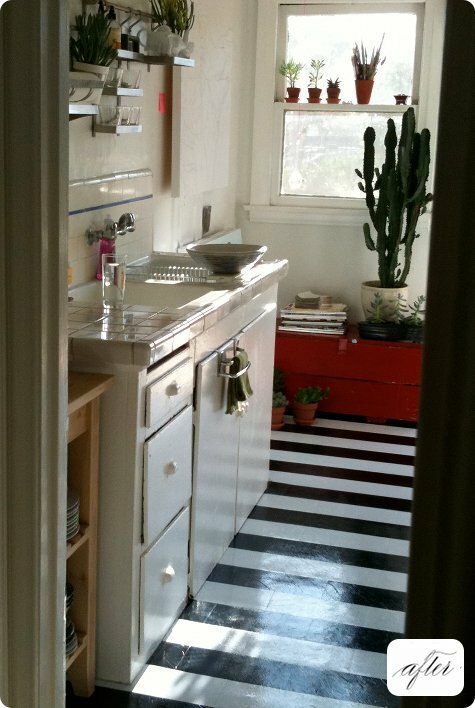 These bold black and white stripes are to die for… If I had my way these would be in my bathroom. I’m highly obsessed with stripes. 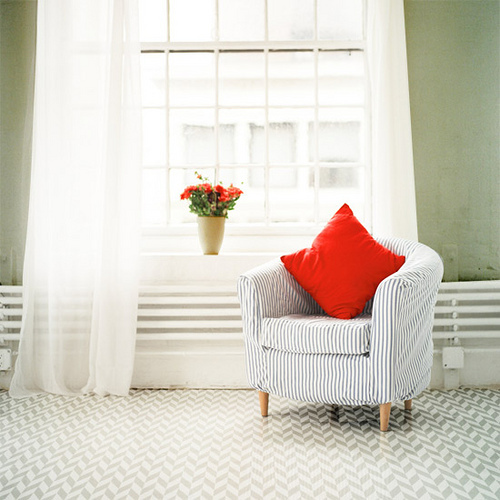 Gorgeous herringbone stencil adds interest, yet isn’t overpowering. 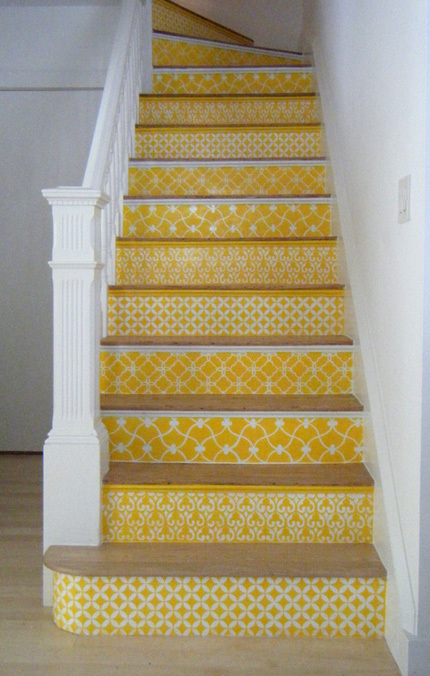 If you have stairs in your house, why not stencil them?! 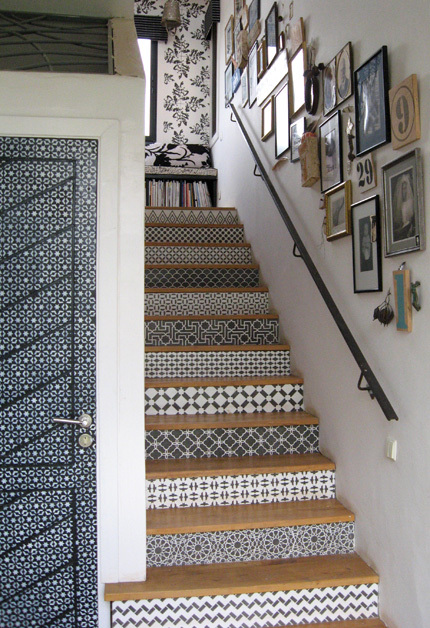 I love the alternating Moroccan designs. Check out their tutorial. 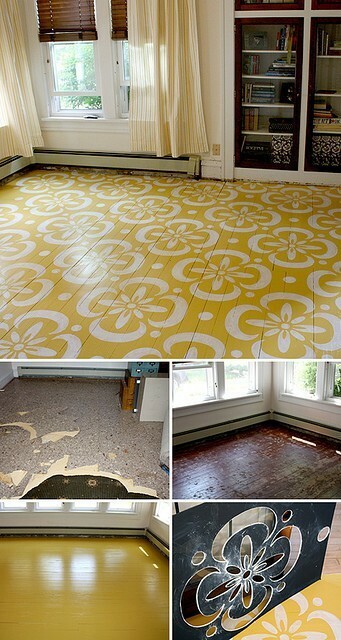 Do you have the guts to stencil your floor?? 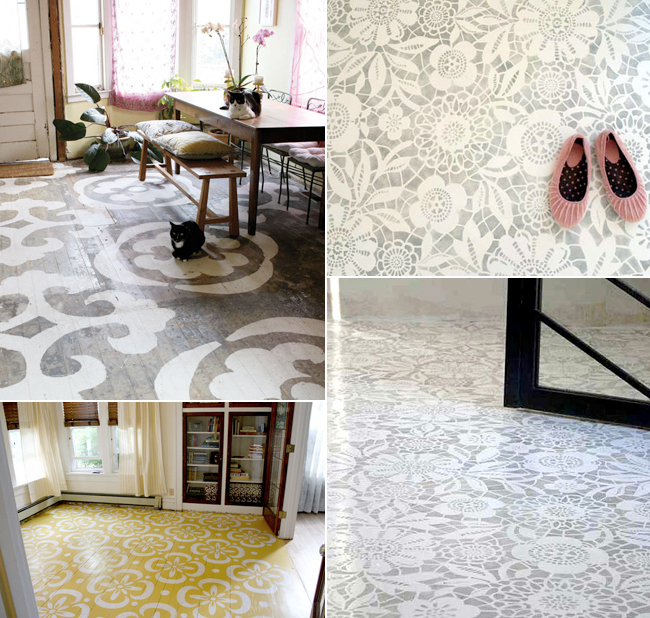 Stenciling is definitely more permanent than just buying a bold rug & calling it a day. What do you think?